Tahir-ul-Qadri, chief of Pakistan Awami Tehrik, who led a Long March on Islamabad last month, to press for electoral reforms, has now moved the Supreme Court, seeking reconstitution of the Election Commission of Pakistan. Qadri’s latest move is also seen with suspicion as parliamentary elections are just few months away and major parties say they trust the current Commission as it was constituted under the Constuitutional provisions. But Qadri, who has not yet decided to take part in the polls likely to be held in May, says that the Commission’s members were not selected in accordance with the procedure in the constitution. “The current composition and its formation is illegal and unconstitutional. I, in my petition, have requested the Supreme Court to abolish the Election Commission and issue orders for the reconstitution of the Commission,” “Sheikh-ul-Islam’ Qadri told reporters minutes after filed the petition. Explaining the relevant constitutional provisions, he argued that the Constitution was not followed in the composition of the Commission. He said that the Prime Minister and leader of the opposition will send 15 names, three names for each post to the parliamentary, that will have 50 percent representation each from the treasury and the opposition benches. “When the parliamentary panel receives the names it will call the nominees for public hearing and there would be cross-questions and the members will have the right to ask questions,” he said, while explaining the article 213 of the Constitution. He said that the committee will confirm the nominees after the hearing, adding that the government and the opposition had not held hearing and appointed the members under their own formula. “Then the President appointed the Commission’s members in violation of the Constitution.” He claimed. He prayed the apex court to stop the Commission’s from function unless the court’s verdict as he has no legal status. Qadri returned to Pakistan in December after five years in Canada and is now holding Canadian nationality and he cannot take part in elections for holding dual nationality. He has not yet decided whether his Awami Tehrik will take part in the elections but he is now involved in talks with other parties for a possible seat-to-seat adjustment. 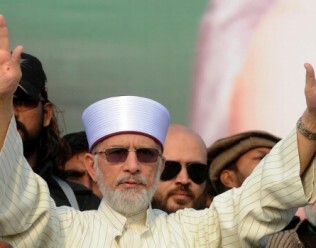 A team of the Pakistan Tehrik-e-Insaf met Qadri in Lahore on Wednesday and discussed seat adjustment. Political parties are advising Qadri to take part in election and to test his popularity through his slogans of a revolution.